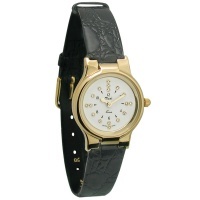 Ladies 6 o'clock Opening Elegant Braille Gold Tone Quartz Braille Watch that has Braille Diamond Like Stones. 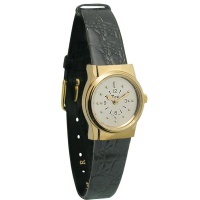 Gold Case w/ White Dial-Braille Dots and 1-12 Black Numbers - Black Leather Band w/ Gold Buckle. Battery included. Size of Dial 15/16. The only Classic Ladies Bi-Color Quartz Talking Watch that has time and alarm announcement with clear male voice. 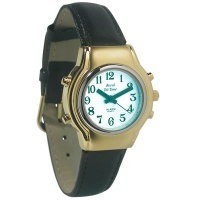 Bi-Color Case Matte Finish w/White Dial and 1-12 Black Numbers-Black Leather Band w Gold-Tone Buckle. 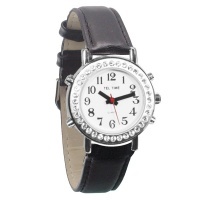 The only Elegant Ladies B-Color Quartz Talking Watch that has time, alarm, calendar, timer annoucement with clear male voice. 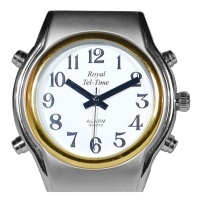 Bi-Color Case Polished Finish w/White Dial and 1-12 Black Numbers. 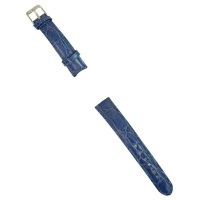 Black Leather Band w/Gold-Tone buckle. Easy to set. Powered by 2 lithium batteries (included). Dial size: 1-1/4" Diameter. World traveler or not, this Radio Controlled Ana-Digit Watch is the perfect accessory for those who are looking for truly accurate time. The real single-battery Ana-Digit movement synchronizes the second on LCD and Analog, always giving you the most accurate time. 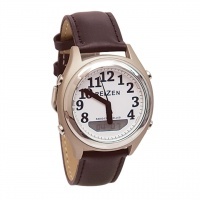 It includes an auto calendar on LCD backlight showing date-day, month-year or hour-minute. The large bold black hands with sweeping second hand are easy to see and read. And there's even a 1/100 second chronograph stopwatch. 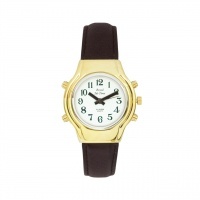 12/24 hour selectable. 2-year CR2025 battery included. Face measures approximately 1-1/4 in. diameter. 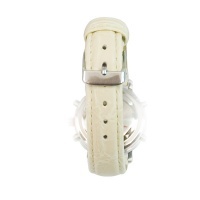 White face watch and hands-on black leather band.